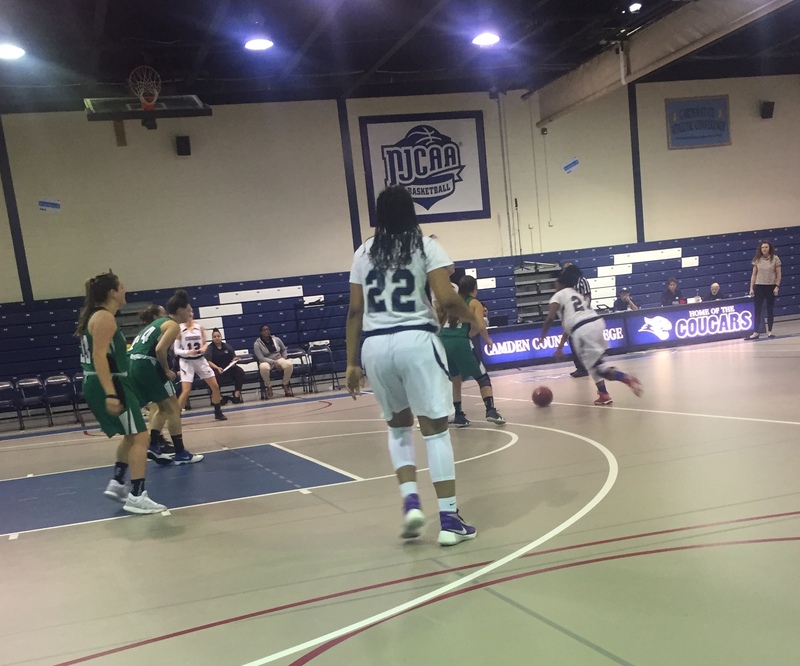 BLACKWOOD – The Camden County College women’s basketball team got its first win of the season Saturday, defeating Ocean County College 43-24. In holding the Vikings to a season-low 24 points, the Cougars put on a defensive clinic as several players showed the importance of defense in the win. “A lot of our shots were not falling but our defensive effort helped us a lot today,” said CCC player Laniya Rolax. The result was a much-needed win as the Cougars had gone 0-5 before Saturday’s game. “We needed this game bad,” said CCC player Divyon Ballance after the game. The Cougars showed a sense of urgency in the game. The game’s leading scorer was CCC’s Victoria Murphy, who scored 18 points on 8-for-17 shooting. She finished with six rebounds, two assists, two blocks and two steals. The game’s leading rebounders were Ballance, who had 11 rebounds, and Rolax, who finished with 13 rebounds. The Cougars shot 28.6 percent from the field but held the Vikings to 17.2 percent from the field. The Cougars forced 29 turnovers to their 13. The Cougars had 15 assists and 14 steals, which both were season highs. “It was a great team win,” Ballance said. The Vikings’ leading scorers was Amy Galasso with eight points. She had five rebounds and one steal. The Vikings’ leading rebounder was Jenna Kulinski with 13 rebounds. She scored two points.